Now that I have your attention, this long essay is my response to the frequent requests to summarize my analyses of the concept of addiction, particularly how it relates to tobacco product use. I should note that the headline is based on the most commonly-accepted definition of “addictive”. I will work my way through that to other senses of the word under which smoking might be considered addictive. In their recent journal article, “U.S. adult perceptions of the harmfulness of tobacco products” (abstract here), a group of researchers from the FDA, other federal agencies, Canadian and American universities suppress important information about safer tobacco products. G.T. Fong and 11 co-authors used federal funds to analyze the FDA Population Assessment of Tobacco and Health (PATH) Survey with respect to perceptions of eight non-cigarette tobacco products’ relative harms. Half of smokers and ex-smokers living in Yorkshire and the Humber would NOT try vaping – with many believing it is just as bad for you as cigarettes, a study found. Researchers found tobacco users are ‘suspicious’ of e-cigarettes and have no desire to give vapes a go – despite health professionals urging them to do so. Federal Communications Commissioner Jessica Rosenworcel is demanding a multi-agency crackdown on the alleged scourge of e-cigarette advertising. According to Rosenworcel, we’re witnessing the birth of the 21st century Marlboro man. The rugged cowboy has been replaced by young Instagram worthy millennials nonchalantly vaping while surrounded by bright colors. Überraschenderweise hat der Direktor der FDA, Scott Gottlieb, seinen Rücktritt angekündigt. A collection of researchers with a history for delivering negative results from poor studies has announced that vaping is associated with wheezing in adults. They produced an accompanying press release, which was snapped up and regurgitated by the Daily Mail – which failed to provide any comment or balancing opinion. Irfan Rahman has been knocking vaping and harm reduction for years. In 2016, he was part of the University of Rochester Medical Centre research team that claimed vaping led to damage to gum tissue. Scott Gottlieb was welcomed with caution by harm reduction advocates when he took on the role of Commissioner for the Food and Drug Administration (FDA). He had a history of supporting harm reduction strategies and was seen as a hands-off pragmatist, but his actions on vaping proved him to be anything but. The vaping community will now wonder if his resignation is a sign that the US Administration is looking for someone with a more relaxed approach to business regulation. Scott Gottlieb’s resignation from the FDA gives people the opportunity to look at his legacy, and is writ large in the inappropriate actions of Athletic Director Rich Edwards. Thanks to Gottlieb’s part in promoting the notion that there is a teen vaping epidemic, and that nicotine somehow impairs brain development, children have seen their basic rights restricted. A child in Arizona has been strip searched in the hunt for a vaping device. In Parliament, Lord Palmer, Baroness Blackwood, Alex Cunningham, Adam Afriyie, Andrew Gwynne, James Brokenshire, Ranil Jayawardena, and Steve Brine have recently discussed matters relating to vaping and tobacco harm reduction (THR). In the House of Lords, Lord Palmer asked Baroness Blackwood who were the tobacco control experts consulted over the proposed changes to tobacco packaging. Councils in England claim they are improving public health despite budget cuts slashing services. Juice flavours are apparently a problem for the FDA, but not an issue at all when combined with amphetamines. Legislators push to restrict vaping to over-21s in Texas. 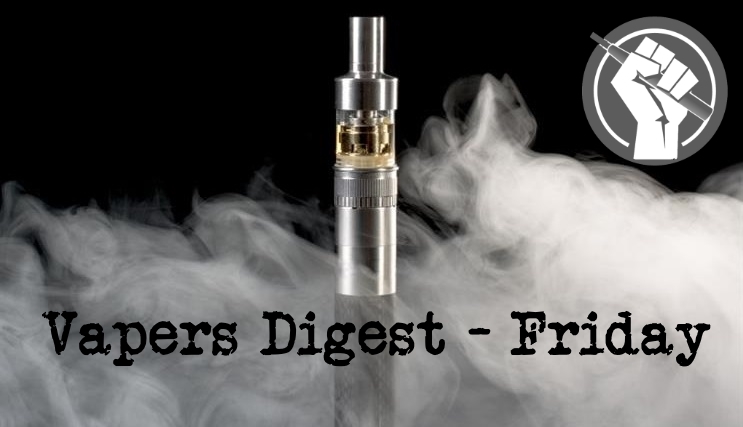 Harm reduction moves forward but then stumbles in Estonia, and a holidaymaker in Thailand has been imprisoned then deported for holding a vape device. Big tobacco companies were publicly pilloried when they were found to have misled the public about the dangers of their products. To this day, that industry remains a touchstone example for corporate malfeasance. But when public health officials use similar tactics to spread the misleading claim that e-cigarettes are “no less harmful” than combustible tobacco products, it can lead to fewer smokers switching to safer alternatives. The result is that more smokers will die, while public health officials face few repercussions. It may come as a surprise, but nicotine has been found to have a positive impact on brain activity. Don’t expect experts to start handing out cigarettes for brain health research, but the discovery did trigger a new national study into how non-addictive nicotine patches can stimulate the brain. “We know it’s likely to affect memory and attention,” said Dr. Jacobo Minzter, chief research and innovation officer at Roper St. Francis. JUUL Labs has launched a program to promote partnerships with businesses and managed healthcare and insurance companies to offer JUUL products to employees who want to quit smoking. According to a story published by CNBC, the San Francisco-based vape company is building an “enterprise markets team,” led by former Cardinal Health executive Douglas Roberts, who was hired by JUUL last year. The team has 17 employees so far. Business owner Jay Karanouh says he’s treated worse than a tobacconists – yet his store does not stock anything with tobacco in it. Mr Karanouh runs House of Vape, one of Sydney’s better known vape stores in Five Dock, with his store turning over about $1 million in sales each year. Despite employing six people and contributing to the economy, Mr Karanouh said he’s shunned and made to work under tighter restrictions because people don’t understand the benefits of vaping in helping people quit smoking. In the face of a public outcry over a potential “ban” on vaping, Wellington City councillors have delayed a vote on vape-free spaces. At a City Strategy Committee meeting on Thursday morning, councillors unanimously voted in a new smokefree action plan but delayed a vote on whether the plan would cover vaping until March 21. All Wellington beaches will be designated smokefree from when Daylight Savings time begins in late September. The Grey St pocket square – a pedestrian area between Grey St and Lambton Quay – will also go smokefree once construction work to upgrade the area is completed in the next few months. Do flavoring compouds contribute to aldehyde emissions in e-cigarettes? A recent study found that flavourings are the major source of aldehyde emissions in e-cigarettes. This replication study found aldehyde emissions lower by up to 589-fold compared to the previous report. Unflavoured liquids also emitted aldehydes using the same e-cigarette devices. Tobacco control activists and academics are gathering in Cape Town for the World Conference on Tobacco or Health 2018 (#WCTOH2018). High on the agenda is the role of the tobacco industry and how to fight it (e.g. see this session:”Breaking Big Tobacco’s Grip“). In a guest posting below, David Sweanor provides an alternative perspective they are unlikely to hear discussed much at their conference.